Looking for the ideal wedding venue and the perfect golf course for a relaxing day with your best men before your big day? Well, look no further than Troon and our Perfect Match Groom's Package. Our golf facilities offer the best of both worlds for the bride and the groom! We offer first-class service and exquisite ceremony sites and reception locations, as well as discounted golf at some of the world's premier courses. While many golf clubs restrict you to hosting your golf outing at the facility at which you booked your wedding, select Troon facilities offer more flexibility, by allowing you to host your wedding at one facility and plan your golf outing at another. *The National FourSome card provides the cardholder and three guests up to 50% at numerous Troon-managed facilities in the U.S. and Mexico. Card is valid from date of wedding through the end of the calendar year. Weddings scheduled in October, November & December will receive a card for the following year. The Troon Card can be placed in either bride's or groom's name. 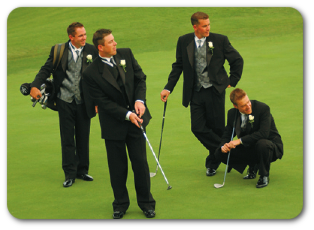 Must have a contracted wedding and groom's package at a participating Troon-managed facility. Cancelled weddings and/or groom's packages make the couple ineligible for receiving a National FourSome card. Troon card subscription will be terminated if there is any outstanding balance due to the facility after one week following the wedding. Troon reserves the right to modify this offer at any time. **For groups of 4 players or more. Tee times are based on availability. May be booked up to 60 days in advance. Tee times must be reserved through the F&B manager at the wedding's host facility. The golf day must be played before wedding date. Discount cannot be combined with any other offer, promotion or discount. Not valid on existing tee times. Must have a contracted wedding at a participating facility. ***Merchandise discount applies during the week of play.